European Multihull of the year, boot Dusseldorf 2019. 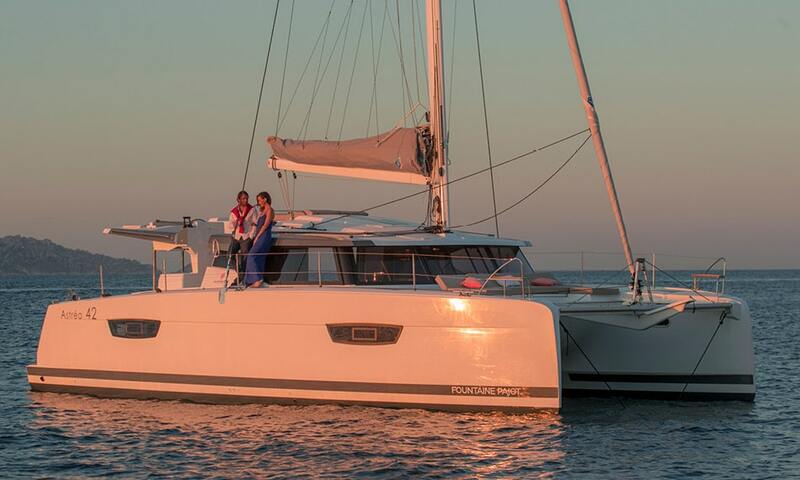 The innovative Fountaine Pajot Astréa 42 is a very smartly designed, easy to handle sailing package. With many of the features of her bigger sister, the hugely popular Saona 47, she is all about comfort, style, and performance. The signature inverted bow and flared hulls gives an elegant and dynamic line while offering incomparable interior space. Smooth flowing communication between all areas of the boat is forefront in the design. Beach Club tender-lift, integrated BBQ, finer entry hulls, elevated helm and modern contemporary décor below are just a few of the highlights. 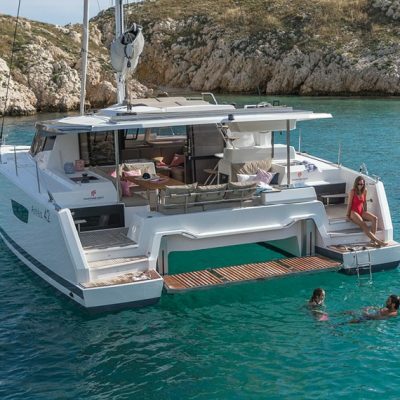 The Fountaine Pajot Astréa 42 was awarded “2018 Multihull of the Year” by Le Monde du Multi and the famous French magazine, Voile. If you would like to find out more or buy a Fountaine Pajot Astréa 42 contact us here, or email Robin Hodges, our yacht sales manager. robin@horizonyachtcharters.com . 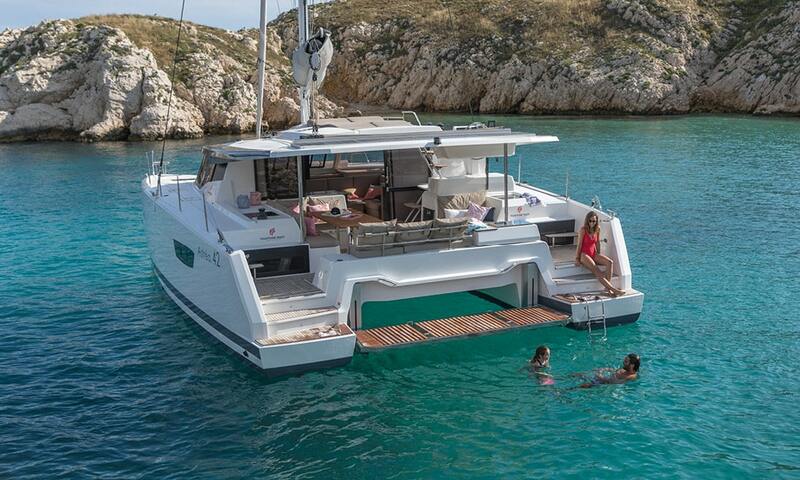 The Fountaine Pajot Astréa 42 is outstanding in encouraging interaction between helm and everyone on board. The elevated, double seated, helm station is almost the centerpiece of the cleverly designed outdoor living space and offers a flowing dynamic between cockpit and helm. Offset to starboard and comfortably seating two, it is accessed by a small flight of stairs it is configured so that there is easy communication between the helm and crew below. Additionally on the coach roof, right next to the helm is a built-in sun lounger which enhances the interaction between helm and relaxing sun-worshippers. The spacious cockpit is the perfect place to relax and entertain. A generous bench settee with backrests along the transom neatly incorporates a BBQ grill to starboard, and the port side L-shaped settee around the table happily seats everybody. There is also recliner bench seat for lounging to starboard, as well as a fridge under the stairs to the helm for easy access to refreshing drinks. At the bow, there is another lounge area and trampoline giving a marvelous secluded relaxation area away from the bustle of the cockpit. And do not forget the very neat optional electric tender-lift, which not only makes handling the dinghy effortless but also lowers to provide an enticing swim up bathing platform. The ‘Beach Club’ as it is affectionately known. The incredibly comfortable lounge is designed with expansive panoramic windows that bathe the interior in natural light. Forward to port, is the angled navigation station, with its seat integrated into the comfortable L-shaped settee around the table. Her U-shaped galley transitions seamlessly with the cockpit courtesy of a vast fully retractable sliding door and window. With 3 burner stove, double sinks and fridge the galley is functional and tidy and has a lovely countertop oven for easy use. As with other FP’s the Astrea’s available in multiple cabin configurations, including three- and four-cabin layouts. Each layout has dedicated heads. The three cabin Maestro version sees the entire starboard hull configured as a master suite. This comprises a large double island bed aft and a very generous bathroom with cleverly designed separate shower up front. (as you see on the Saona 47). They’re separated by a ‘dressing room’ which also functions as a study/office. The four cabin version offers large aft cabins with en-suite bathroom and the forward cabin almost identical with a slightly smaller bathroom. Large hull windows and hatches bring plenty of natural light. The styling feels modern, light and contemporary and enhances this very classy spacious accommodation space. With three different base configurations of equipment, a variety of technical options and multiple choices of upholstery both interior and exterior you can customize this boat to your own requirements. The mainsail and genoa are operated using three winches atop the coach roof forward of the helm. There is a neat tail storage bag for excess rope and a passageway separates the helm-station from the sail control area giving plenty of room for crew to work the lines and keeping the helm-station clear. The mainsheet traveller mounted on the cockpit roof, immediately aft of the helm station, helps with trimming the mainsail into its optimum shape. The boom sits relatively low and with the expansive coach-roof stowing the mainsail into its bag is easy. Also with the extended coach roof there is space for solar panels behind the traveller for extra help with keeping batteries charged. The genoa is sheeted through cars on the coach roof giving decent sailing angles upwind and an optional bow-sprite and genaker will enhance the off-wind sailing experience. Under power the 40HP upgraded engines offer efficient cruising at over 6.5 knots and plenty of control when close quarter maneuvering. 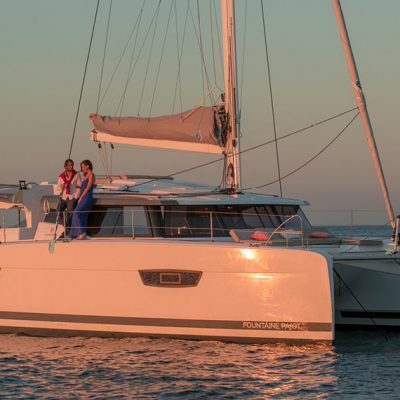 If you would like to buy a Fountaine Pajot Astréa 42 for private use, or for placing in our highly regarded charter fleet in the Caribbean, or would simply like to learn more about this or another Fountaine Pajot model email Robin Hodges. robin@horizonyachtcharters.com Full contact details for our team can be found here.